Hello and welcome to my second blog post today. 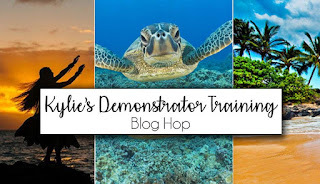 I am popping on again to take part in Kylie's Demonstrator Training Blog Hop, we all have some wonderfully fun projects for you and I know that you are going to love having a look at all of them. 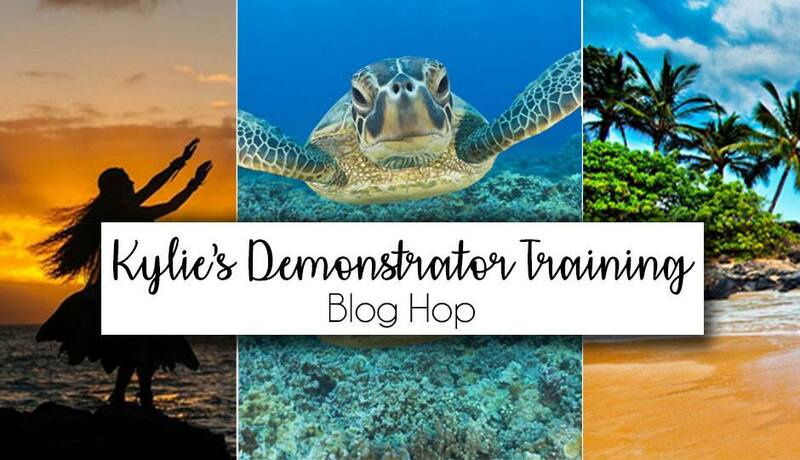 This hop will take you around the world well several countries with demonstrators that take part in Kylie's international demonstrator training. 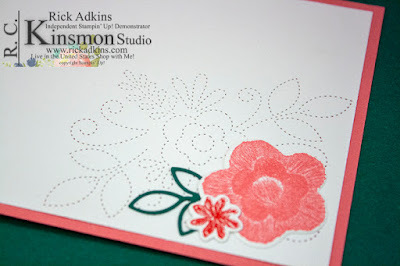 For my card today, I created a fun feminine birthday card featuring products from the Needlepoint Nook Suite in the 2019 Stampin' Up! Occasions Catalog. Here's a look at my card. I picked the some of the Needlepoint Nook Suite to use for my card today, one because it's a very pretty suite and I feel that it hasn't been used to it's fullest as of yet. 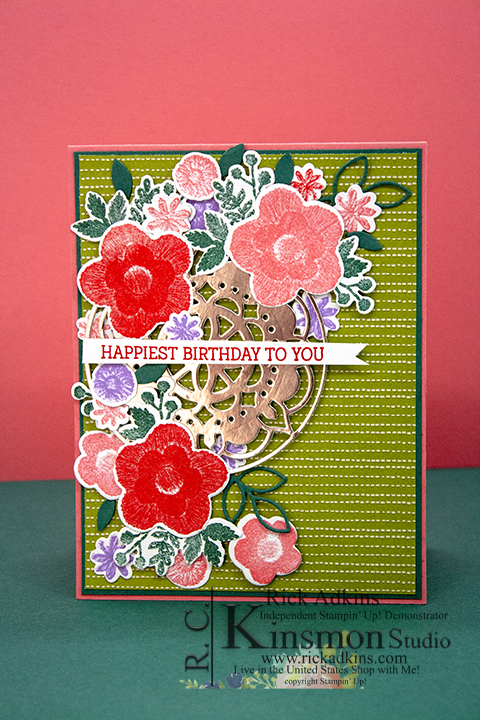 I paired the Needle & Thread bundle with the Eastern Medallion thinlits to create a fun whimsical card that is perfect for a birthday. I started out my cutting a piece of Flirty Flamingo Cardstock to 4 1/4 x 11 scored at 5 1/2. I used a piece of the Needlepoint Nook designer series paper that was cut at 5 1/4 x 4 which I layered on a piece of Tranquil Tide Cardstock (4 1/8 x 5 3/8). The products from the Needlepoint Nook suite have a fun quality to them, the images from the designer series paper was first created by one of the designers from Stampin' Up! and then photographed and laid out in Photoshop to create each pattern. 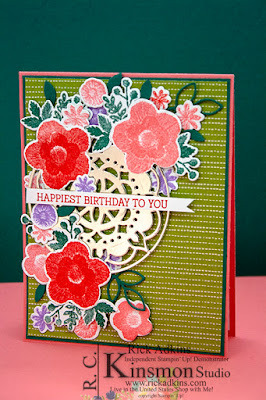 The Needle & Thread stamp set is our first Distinkive set in photopolymer, which makes it extremely cool. 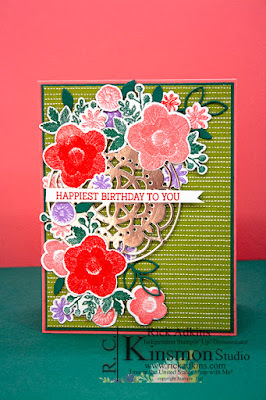 I stamped several of the floral images from the Needle & Thread stamp set using colors that I pulled straight from the Needlepoint Nook Designer Series Paper. 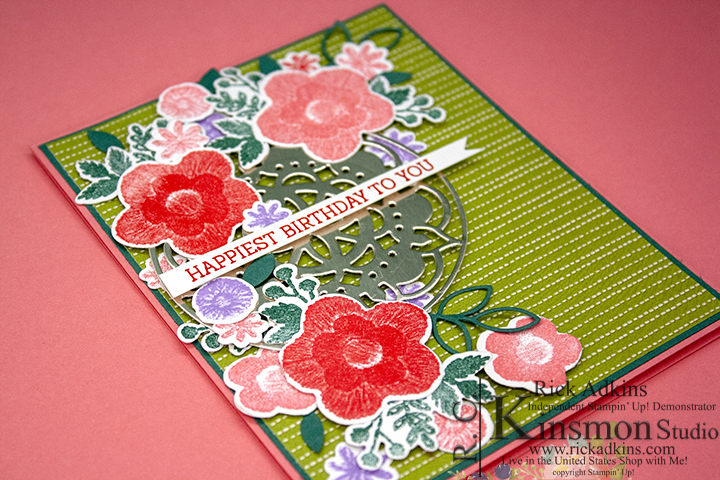 I used Poppy Parade, Flirty Flamingo, Tranquil Tide, and Highland Heather inks. Once I had everything stamped I used the matching framelits to cut them out. 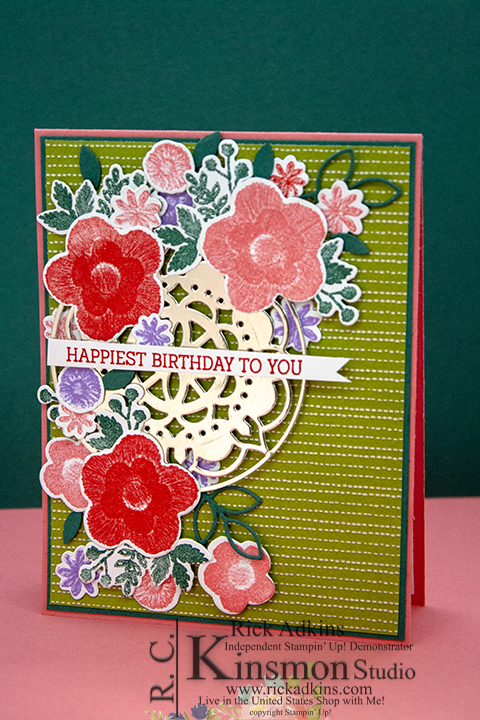 I layered and arranged the flowers that I stamped and then cut them out using the matching framelits. I also used cut on of the Medallions out from the Eastern Medallion Thinlits from Champagne foil to help add a little sparkle and shine. For the inside I added a piece of whisper white cardstock and used one of the stitched dies and added it to the inside of the card. I hope that you have fun hopping along with us today. You will find a list of everyone hopping along today. You can click on the next person in the list below to go to the next hop. 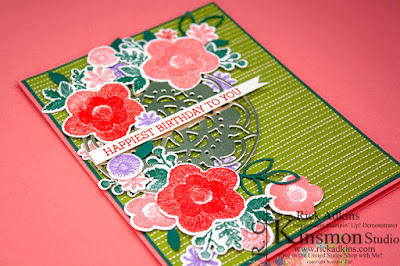 You will also find a full list of all the supplies that I used for today's card below the blog roll. 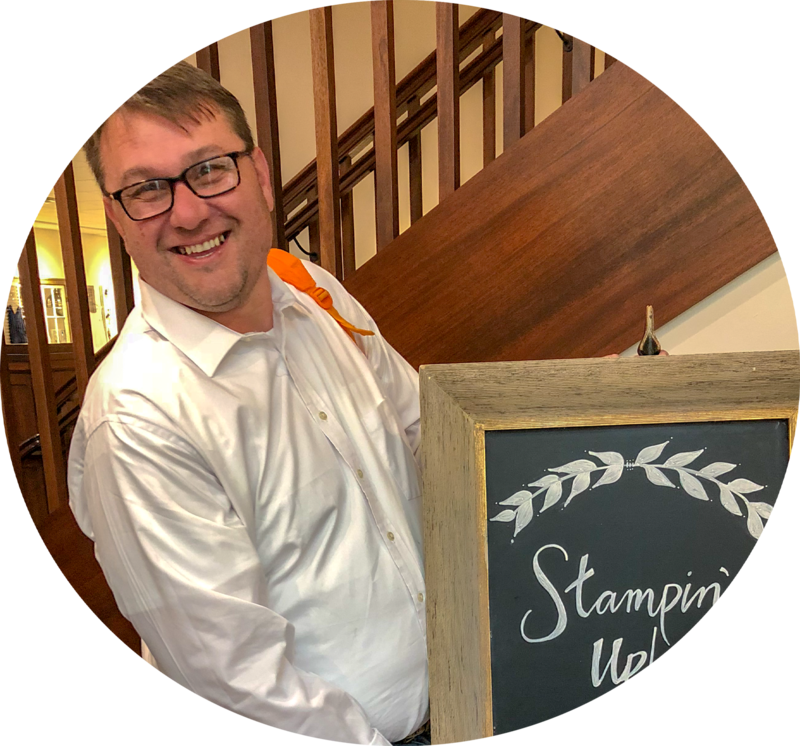 Labels: stampin' up!, crafts, cardmaking Kylie's Demonstrator Training Blog Hop, Needle & Thread Stamp Set, rick Adkins, Stampin' Up! Absolutely beautiful Rick. Love the colours, and popping in the piece from the Eastern Medallions is genius! Fabulous card Rick. 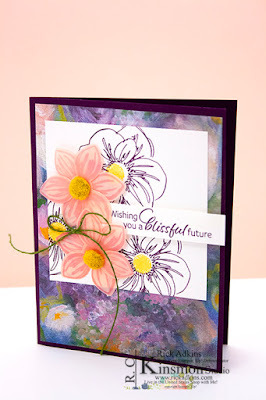 Love the vibrant colours you have used. Absolutely gorgeous card, Rick! Love how you added the medallion.